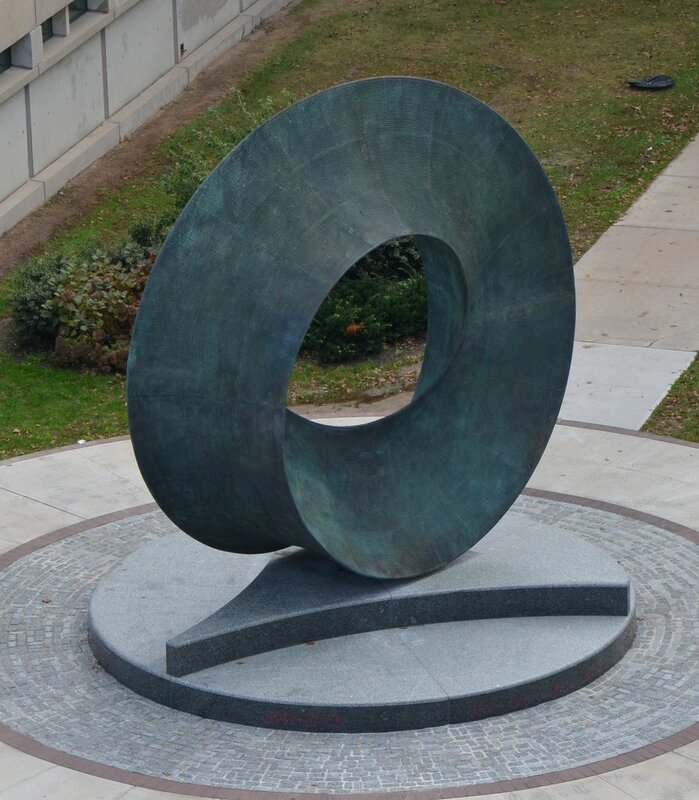 The “Umbilic Torus SC” as it will be for the next several millennia, for many generations of researchers, students, faculty, staff and the public to enjoy and be inspired by — is a celebration of mathematics, the queen of the sciences — a celebration of first order in granite and silicon bronze. The art historian Herbert Read saw the mathematician as an abstract artist “except that he does not possess, or has he cultivated, the ability to express his mathematical conceptions in a plastic material.” Ferguson is exactly that abstract artist who fully possesses and has cultivated his ability to express his mathematical conceptions as sculpture. 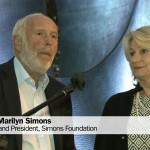 He has discovered the common ground of mathematics and art upon which he has placed his own creativity. — Richard Waller, Director of the Marsh Art Gallery, University of Richmond, Virginia. Helaman Ferguson earned his A.B. 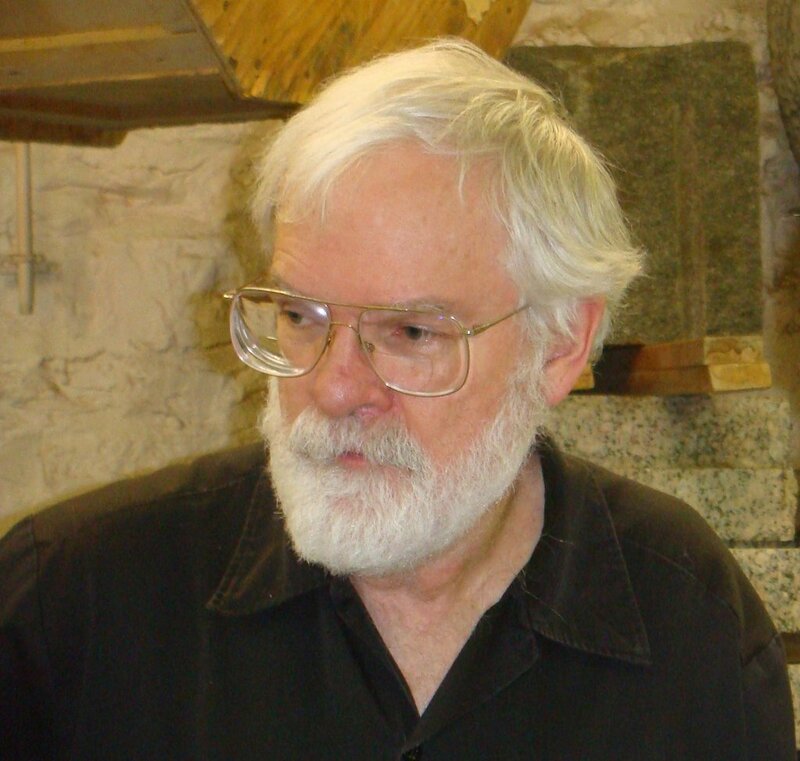 in Liberal Arts from Hamilton College and his Ph.D. in Mathematics from the University of Washington and has devoted the last 40 years to creating intricate sculpture based on complex mathematical phenomena. He uses many different kinds of specialized tools, including computers, virtual image projection from equations, tool position and orientation monitoring, air hammers and drills, pulleys, hydraulic rams, and gantry cranes. He uses a hammer and chisel, as well. Dr. Ferguson’s studio is a canal through which mathematically designed things take form in geological materials. His work can be further experienced at www.helasculpt.com. 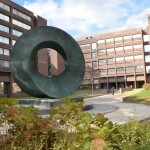 Watch the UTSC dedication ceremony from 10/25/2012. 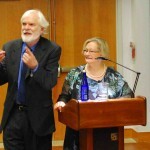 Watch the UTSC presentation by Claire and Helaman Furguson from 10/25/2012. 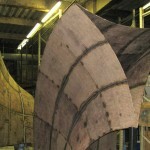 Watch a 4 minute video of one of the panels being created. 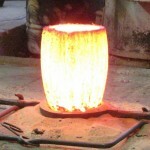 Molten bronze is pored into a sandstone mold at Foundry. The form of Umbilic Torus SC is a continuous, donut-shaped surface patterned with a space-filling curve. It stands as a monument to the timelessness of man’s creativity as though it had just been unearthed with painstaking care from a Chinese tomb or an Egyptian pyramid—its Faience-tinted bronze corroded by centuries of silent waiting. The space-filling curve is as mysterious as the Chinese calligraphic script or Egyptian hieroglyphics—flowing over the surface, defining it, beginning at any point and meticulously returning to that point after traversing every inch of its area. The form of the space-filling curve is universal, known from the earliest architecture and ornament. The angles of the space-filling curve play a harmonious counterpart to the torus, or ring, which has always signified unbroken love. Like Brancusi, Helaman Ferguson uses the nature of the material itself to become part of the work’s meaning and expressiveness. The earliest known use of sand moldings in metal casting dates back to 645 B.C. from China. Used to create this piece as well, it contributes to the viewer’s sense of continuity with the past. Helaman Ferguson’s art embodies essential truth, mathematical theorems, which he takes from the spiritual realm of pure reason and clothes with forms accessible to us all. Ferguson, C. (1994). 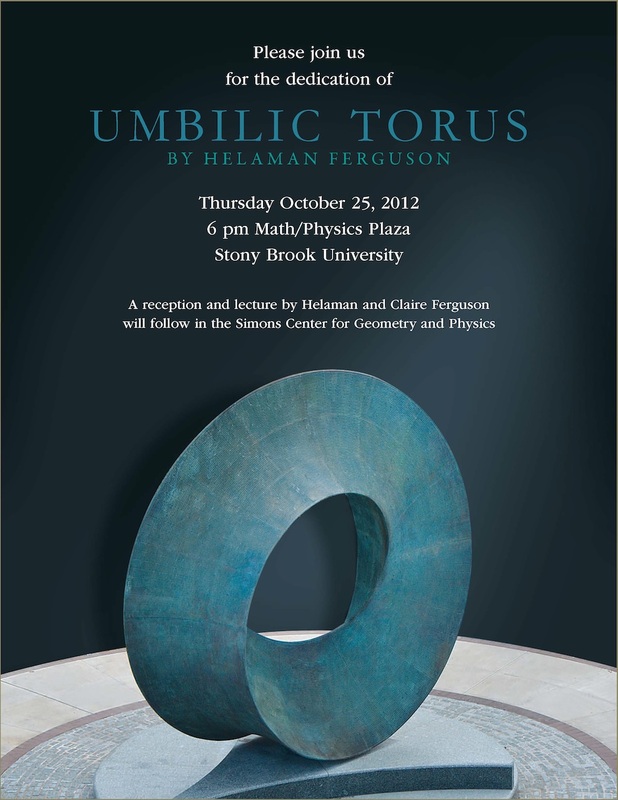 Helaman Ferguson: Mathematics in Stone and Bronze. Pittsburgh, PA: Meridian Creative Group.